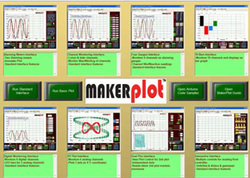 This is what you'll see when you first launch MakerPlot. 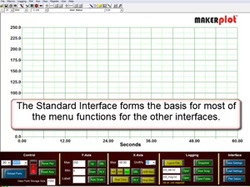 Interfaces are the GUI screens that you can use to plot analog and digital data as well as data log it. We made these interfaces so you can start plotting "out of the box" without any coding or redesign. Just click on any of the interface images to bring it up and start plotting! The Standard Interface defines the menu system of buttons, switches and text boxes for most of the other interfaces. You are encouraged to pay particular attention to this video as it shows how easy it is to connect to your micro via a serial link, change the X and Y axis scales, perform data logging, take screen snapshots and save and reload interface settings. In the Alarming Meters Interface video you're shown how to set minimum and maximum alarm settings for two meters. You're also shown how to adjust the meter's attributes like scale, color, tick marks and more. 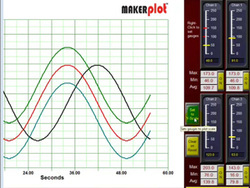 What you learn about these two meters can help you with adjusting the other MakerPlot meter styles used in the other interfaces. 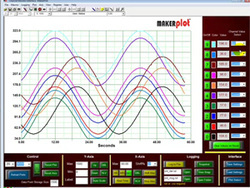 The Channel Monitoring Interface allows you to plot up to 10 analog channels and view each one of their individual amplitudes, minimum and maximum and average values, as well as being able to select the color of each of the plotted lines. With the Digital Monitoring Interface you can plot up to 8 channels of digital data and have individual LEDs monitor them. You can also label each channel with a text label. There are also two 10-segment LED indicators to monitor two channels of analog data. 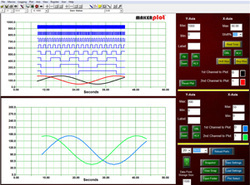 This interface uses two separate plot areas for plotting analog and digital data. Each plot area is independently controlled. 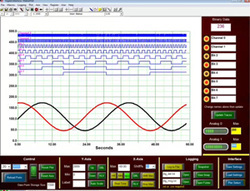 Four vertical meters monitor 4 analog channels where you can set individual minimum and maximum alarms for each channel. 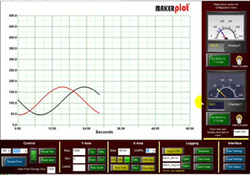 Below the meters are text boxes that display the minimum, maximum and average values for the analog plot. You can even set the meter scale to the Y-axis by just clicking a button. 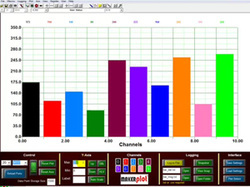 The 10 Bars Interface plots up to ten analog channels in bar graph form. The amplitude of each channel is displayed at the top and you can change the color of any bar using the menu buttons below. Instead of plotting data against time the XY Plot Interface plots three sets of analog channel pairs. You can view interesting displays of data in this plotting scenario. For example, the plots in this video are all sine waves, yet two pairs of sine waves produce circles and one pair produces a line. Find out what interesting combinations you can generate with your data!